Looking for New Members for Our mixed ability Dance Company! If interested in joining, contact us at 520-622-4100 for an audition appointment. 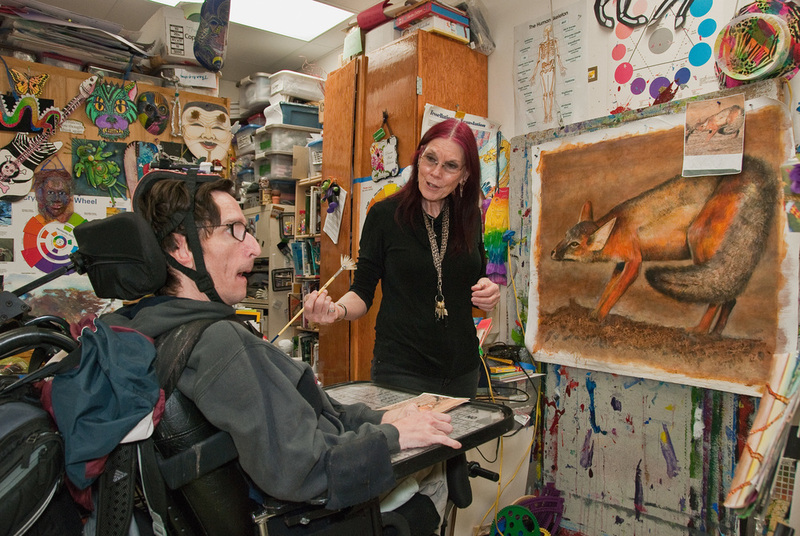 Through the framework of visual and performing arts, adults with disabilities experience meaningful relationships and gain self-esteem. Classes are offered daily in dance, drama, music, exercise, ceramics, painting, and drawing.The adult participants attend performances (Arizona Theater Company, Borderlands, Invisible Theatre, etc. ), parks, therapeutic swimming, libraries, local museum, and more. Adult Dance Company and Drama Ensembles are available by audition. Choices are offered throughout the day to provide greater autonomy and self-confidence. The Laser Art Technique (L.A.T.) program is exploding onto the art scene. L.A.T. is a technique devised for mobility. Utilizing a laser mounted on custom head-gear, the artist is able to direct his or her artist creations through the laser to a tracker. The tracker is trained to be the artists' hands. The tracker stands by the canvas and paints what the artist directs. For more information please take a look at our brochure and reach out to us with any questions!